CNC multi-spindle automatics normally have six spindles, but the German manufacturer, INDEX, has broken the mould by introducing an 8-spindle model in its Multiline series, designated MS22C-8. Available in the UK through sole agent Kingsbury, Gosport, the multi-axis turn-milling centre with its two additional stations is able to machine components of even higher complexity in the short cycle times for which multis are renowned. 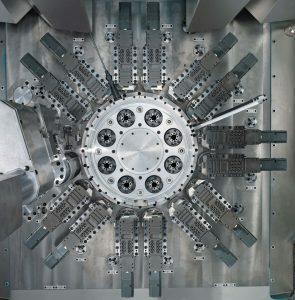 Alternatively, it is able to produce simpler parts in half the time using the machine as a double 4-spindle auto, indexing the drum by 90 degrees each time instead of 45 degrees and producing two parts per cycle. Smaller batches are produced as efficiently and economically as larger runs and the machine is capable of incorporating a wide range of operations into production cycles. In addition to turning, they may include drilling, elliptical deburring of cross holes, milling, hobbing, tooth milling, deep-hole drillingand slotting. As always with INDEX multis, the speed of each spindle can be controlled independently, so cutting parameters are not compromised at any station. The spindle and also the spindle drum are fluid-cooled to minimise thermal growth. The advantage compared with the previous air-cooling approach is more efficient energy recovery from the spindle drum. In addition, the spindle bearing temperature can be maintained at a low level, prolonging service life and improving thermal stability. Each spindle is assigned two cross-slides that travel in both the X and Z axes and optionally in the Y-axis as well. Machining operations can be freely defined at all spindle stations. Standard tool holders and interfaces can be used with appropriate adapters (Capto, HSK, VDI, INDEX). The cross slides have integrated drive and a low-mass design with hydrostatic support that is wear-free and avoids stick-slip. Low moment of inertia leads to highly dynamic movement for rapid acceleration, while outstanding damping characteristics prevent the transfer of machining vibrations to the adjacent slide via the headstock. It allows, for example, heavy-duty roughing at one station while high-precision finishing takes place at another, without sacrificing surface quality. 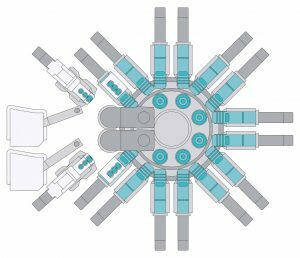 One or two swivelling, synchronous backworking spindles, locked into position by three-part Hirth couplings, can perform simultaneous operations on the rear of the components. A high level of stiffness guarantees that even with bar diameters up to 24 mm, reverse-end machining operations with very high cutting volumes does not compromise machining precision. The spindles are also dynamic, with swivelling to the end position taking less than 0.3 second. The front-opening MS22C-8 can be operated as either a bar auto or a robotically-loaded chucker with the possibilities of integrated measuring and part stacking. The design also allows free access for set-up. To reduce the machine’s footprint on the shop floor, INDEX engineers simply placed the control cabinet on top of the machine, a principle that the manufacturer has used for 15 years and has been well received in the market. Energy efficiency is central to the machine’s design. Weight-optimised components reduce energy consumption and increase dynamic response; energy recovery by means of regenerative drives is included; units that consume large amounts of energy are put into standby after a user-defined time; friction is minimised using optimally paired materials and hydrostatic bearings; and intelligent cooling principles are used for targeted cooling of the machine and reuse of waste heat. The INDEX cooling concept ensures that the spindles, hydraulics and control cabinet are cooled constantly and that all recovered energy can be used to provide heating or to power other manufacturing processes.